In 2011, the cost of leather reached its highest price in more than a decade, so keeping your old leather in good condition is even more important. Leather, like skin, ages and wears down and after a period of time will stretch out and lose its integrity. Fortunately, there are techniques to help return leather to its original state. Proper care and patience is the key to minimizing any damage or undesirable results. Find out what type of leather you have and the tanning process used on it. This information will determine the amount of heat needed to shrink the leather. Alum-tanned leather shrinks at 131 to 140 degrees Fahrenheit. Chrome-tanned leather shrinks at 212 degrees Fahrenheit. Leather that is vegetable-tanned shrinks at 167 to 185 degrees Fahrenheit. You can find out the type of leather you have by checking the label. The company you bought the leather from will also have this information. Purchase or rent a clothing steamer. Hang the leather on a high-quality hanger or lay it down on a flat, dry surface. Steam the leather slowly in small sections, using the heat appropriate for the type of leather you're working with. You should start to see some indications that the leather is shrinking. Periodically test the leather until it has reached the desired size. Allow the leather to air dry and apply leather conditioner to make the leather supple and soft. Repeat Step 1 from Section 1 of this article. Boil water to the required level of heat for that particular type of leather. If the leather is smaller in size, a large pot on a stove should suffice. For larger leather pieces, transfer the water to something with more room, such as a bathtub. You can check the water temperature simply by using a thermometer. Use a sample of the leather to test for color fastness if you can. Shrinking leather with boiling water may damage the coloration of the leather. Submerge the leather in the water for 10 minutes at a time to periodically test the amount of leather shrinkage. Allow the leather to air dry and apply leather conditioner. Beeswax and Neats Foot Oil also recondition shrunken leather. 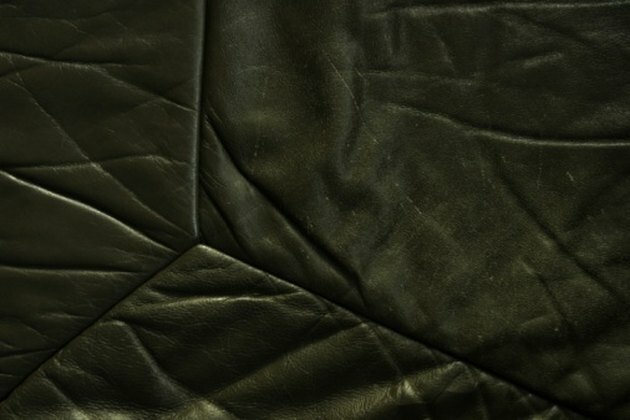 Shrinking leather can harden it and even crack the skin. Shrink slowly and recondition thoroughly to minimize this damage. Stains from the steam and hot water may appear, especially on vegetable-tanned leather. Proceed with caution.